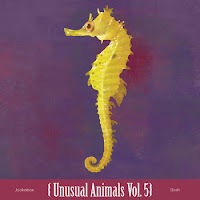 Just noticed this latest release in the Unusual Animals series from Asthmatic Kitty and I haven't heard of either of the two featured and looked them up this morning. Jookabox, aka Granpall Jukabox, is a across the era's, decade mashup-grabbag collection of influences that the next set of artists always seem to do. Just when everything is boring, the mixes...all the bands sound the same..then you stumble across someone like Jookabox. Especially at the pace that music can recycle and appropriate, and end up in the world...it's the thing that I love about music in the first place....the frantic pace that it's created and released in the wild. Nothing else...film, art...these things are so connected to giant institutions with so much money at stake...the moves are calculated, so bogged down in a thousand opinions, voices, compromises. It's an achievement when something great gets made out of that system...because it doesn't seem set up to succeed to me. Anyway, Jookabox is kind of that example of the genius of a someone completely free from convention to work and end up with something completely new. I can at the very least get excited and appreciate this for how alien sounding it is. It's not always going to succeed....cajun influenced acoustic guitar + south bronx + ween = ? But that's where the magic happens. And for anyone that has a tiny bit of interest in making music themselves, this is one of those musicians musician whose going to inspire you every time you hear it to get back behind that 4-track, throw everything away and start over. Same goes for Dosh pages open at once....is this really working? Can I close one? No...it will never line up and make sense this way again. Then one stops or you close the one you thought wasn't working and that's it, it's done. Dosh is working in a more academic way. It sounds measured, weighed out and fused together, like the good days of DJ Shadow. A little in more of an assembage way. It's like accidentally having 5 bands myspacehypnotic, meditative...weird things happening over soft organ. Borrowing from out of print experiments in analog synth...have yourself a moogtastic christmas. A collection of those forgotton beauties, all collaged in an interesting way. The public service these artists do in reclaiming and recontextualizing. Sometimes you get up really early in the morning and everything falls into place. When David "Moose" Adamson was in grade school, his uncle took note of his developing interest in hip-hop and loaned him a four-track. They mixed tracks together and the young Adamson would write rhymes to sing over them, including a double-boombox sequel to Fu-Schnicken's "What's Up Doc (Can We Rock?)" called "Sufferin' Succotash (I Got Whiplash)" At first the beats came from instrumental sides of cassette singles, then from presets on his uncle's drum machine, and finally from his very own beat machine (a Christmas gift), the Yamaha DD-9. Since then, through various incarnations and collaborations with groups such as Archer Avenue and BIGBIGcar, Adamson’s musical interests and excursions have crystallized into a startlingly singular and eclectic songwriting strategy. Jookabox’s debut record, Scientific Cricket, samples a kind of primordial blues sound, children's sidewalk-chalk rhymes and Appalachian folk. But his latest effort finds him moving into new, unplumbed territories. Ropechain pinwheels kaleidoscopically through old-time spirituals, punk, chain-gang hymnal, deep house, and club music hip-hop, blending these disparate elements into a cohesive and unique synthesis. "Dead Zone Boys" gives us a sneak peak of what is to come on Jookabox's third release, due out early 2010. There he was, this musically lucked child of a once-priest and a near-nun, 12 years old and piled high with a Radio Shack combo stereo, stacks of records, and pockets full of dubbed tapes. It was 1984 and Martin Dosh was orchestrating the soundtracks to his junior high school dances, playing only the choice cuts for the budding romantics and perspiring wallflowers: Run DMC, Prince, Devo, the Cars, New Order... Fast-forward to 2003 when Anticon proudly released Dosh's virtuoso debut, Dosh, a loop-building collage of shimmering Rhodes, atypical drumming grounded in groove, field recordings and spontaneous performance (much of the album was pieced together using the 100-plus hours of tape he'd recorded at his parents'). By then he'd developed his untouchable live one-man show (swiveling on his drum stool between a kit, his modified Rhodes piano, a few pots and pans, and a simple looping pedal with a 12-second recording limit), and took to the road. This is the fifth in a series of vinyl-only releases. The series, entitled Unusual Animals, pairs Asthmatic Kitty roster artists with friends and sometimes-unlikely bedfellows. Each record includes a beautiful rendering of one of Mother Nature's stranger inhabitants by illustrator Jared Chapman. This limited-edition series expands the Asthmatic Kitty family to include some unexpected folks. Go get it from Asthmatic Kitty. Anticon has them too, and from what I hear they are close to being out of copies of this so you have been warned.